Comfortable apartment in the heart of Madrid. Sleeps two people in a double bed. There is a sofa bed for an additional guest. It has three spaces, bedroom-living room, dining room, kitchen and bathroom. Fully equipped, wifi, bedding and bath, kitchen, etc .. It is inside but is very quiet. The location is excellent. This in the middle area of ​​the three museums Prado, Reina Sofia, Thyssen, close to Retiro. 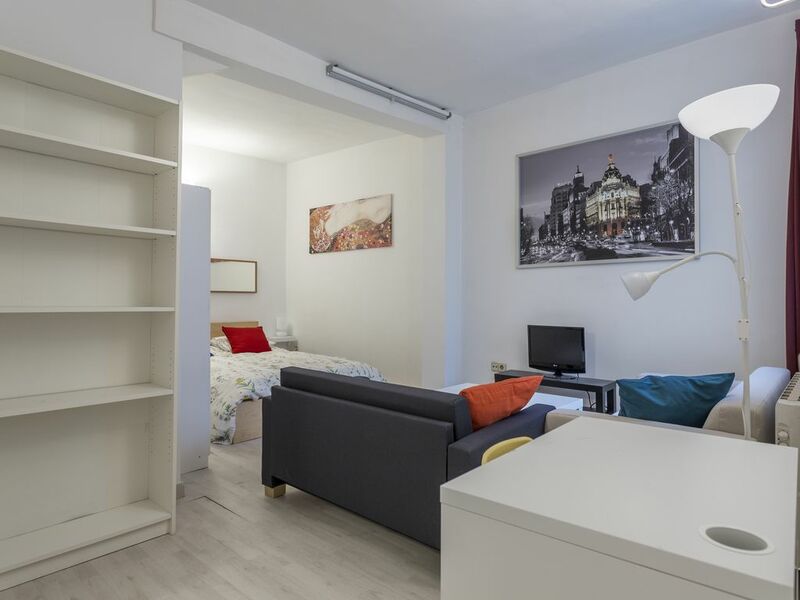 Between the neighborhoods of Huertas and Lavapies, with an excellent range of leisure, art galleries, etc ... 5 min from Mayor, Sol and Gran Vía. With the Atocha station nearby gives excellent communication Ave Station, with airport connection, metro and bus at the door. With all services, Anton Martin Market, pharmacies, etc ... next. We loved Madrid in the spring. Great location. Bed was fabulous. The street door is so hard to push open, we twice thought it was still locked. Kitchen. lighting inadequate. Put some bulbs in the hood above the stove. Tiny bathroom with a wonderful shower. You need to pay more money for creature comforts if you want them. We stayed 3 nights. I would stay again for a few nights, but get a better place for a week. It’s a reasonably old building on Calle Atocha. Excellent location. Not luxurious, and priced accordingly. Basic amenities - only had one mug... but comfortable. Keys take some getting used to. There’s a (or several) knack(s). Old wooden stairs are fantastic. Again, not luxury... but decent. Had a power surge when we had three electrical items on. The apartment building is located on a main street and could be very noisy, but the apartment is located in the middle of the building with window giving into light shafts. Not much to see but very quiet. Very well located, couldn't be more downtown and very close to everything including grocery store. The kitchen is well equipped for those who want to cook. Metro, train and bus at walking distance. The host was very accommodating but we never met. All communication was perform through phone and email exchange. I would recommend this apartment to everyone who want to visit Madrid been centrally located. muy bien recibidos por Sergio y con mucha confianza!! !appartamento muy bien situado para descubrir a pie todo Madrid...el rastro,el prado...plaza mayor a cuarto de hora andando......la estacion Atocha tambien muy cerca...recomendamos esta locacion!